So, Ive had my iPad Mini for a total of three days and I’ve already come up with several product upgrades I’d like to see from a couple of my favorite apps. For those of you that don’t own a Mini, you need to go get one now. You’ll use it twice as much as the standard iPad. It’s the scale of the device. iPad is for media consumption, Mini is combo pack – media creation and consumption. I’d love to see Forkly and Foursquare take advantage of the Mini in the following ways. Forkly – This is a great app for people who love food and may not necessarily be foodies. Take a picture of your food, share it with your friends and tell them how it was. Dead simple. (It actually makes you want to eat out more.) I’d like to see a Forkly Menu on the Mini. Similar to their Forkly powered menu but it would have a list of the meals/pictures that people have shared and their ratings. 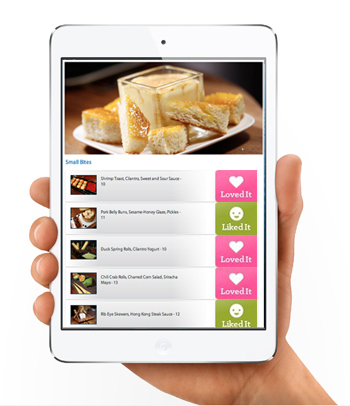 A user would be able to look through the menu and select an item. (Only items within a certain radius would be shown.The radius would be adjustable.) When someone saw something they liked, they could tap it to find out where it’s located on the map and/or make a call for a reservation, if applicable. Fourquare – I love Foursquare and would like to see them create an experiential collage of specific locations. The Mini app would allow you to select a location – maybe one that you frequent – and see all the images and sentiment created for that location over time. (A map interface to select a location.) This would allow people unfamiliar with the location to take an curated look at a location to see if they wanted to go. Think of it as a media-rich recommendation.